On "The Colbert Report," Stephen Colbert riffed on the "biblical" traffic jam in New Jersey. Jon Stewart and Stephen Colbert had plenty of laughs Wednesday at the expense of New Jersey Gov. 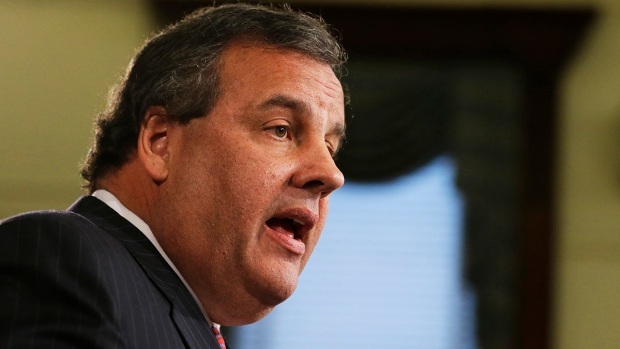 Chris Christie over the traffic jam scandal that has threatened his possible 2016 presidential ambitions. The late-night comics responded after e-mails showed a top aide to the Republican governor punished a Democratic town mayor with gridlock on the world's busiest road bridge after the mayor refused to endorse Christie. "The Daily Show's" Jon Stewart, a New Jersey native, played clips from Christie saying in a statement that he was misled by an aide and questioned why Christie did not apologize directly (Update: Christie apologized to the people of New Jersey during a Thursday press conference). Stewart joked that the bus Christie claimed to have been thrown under by his staff was "stuck in traffic." Stewart also acted as the late-night show's "New Jersey correspondent." He mocked how elaborate and obvious the communication of Christie's staff was by email over the decision to punish the mayor of Fort Lee. Stewart said the e-conversation should have been carried out like dialog in New Jersey mob movies, such as: "Hey, ya took care of that thing?" and "Yeah, I took care of that thing, our good friend Lee is gonna be backed up." Over on "The Colbert Report," Stephen Colbert referred to Christie as the "president of the United States of New Jersey." The late-night host poked fun at the "biblical" traffic delays that "were only slightly longer than normal." "Lane closures were meant to make life hell as payback to the mayor of Fort Lee, New Jersey, for not endorsing Christie for re-election. No word yet what the rest of New Jersey is payback for," Colbert joked.